So what’s Kansas famous for? Well, it’s the birthplace of Former President Eisenhower, automotive executive Walter Chrysler, solo Atlantic-crossing aviator Amelia Earhart and Wizard of Oz legend Dorothy. It’s also the setting for the first Pizza Hut restaurant and (almost) the geographic centre of the United States. Oh, and Kansas is also the place that Cobalt Boats call ‘home’. 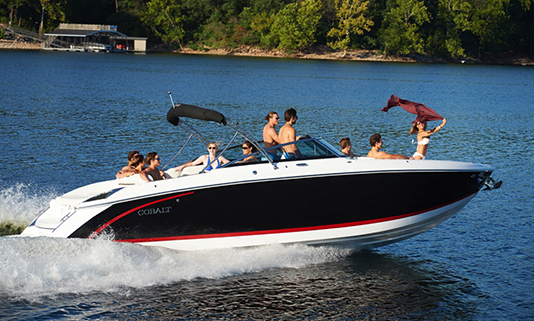 Cobalt Boats has been the market leader in the runabout day boat sector for more than 45 years. Focussing on the 20-foot to 40-foot size bracket, it produces around 30 different models separated out over six ranges from bowriders to wakeboats and cuddies to cruisers. 2016 sees no less than four new models making their debut in the range – a record for the Company in one year. They are the Cobalt A40 Coupe, the R30, the R5 Water Sports Series Surf and finally the Cobalt CS3. 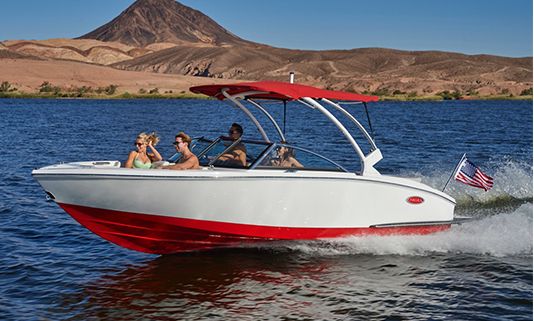 The hardtop version of the Cobalt A40 came out in 2015, immediately making its presence felt in the performance day boat sector, and now the Coupe version has come to join her for 2016. She features slim-line styling, a sleek windshield, a sliding sunroof and a retractable sunshade. The 12-foot beam makes the A40 Coupe exceptionally roomy while luxury finishings and fittings are always in evidence. Below there is a galley, dinette, midship cabin and head with separate shower, all with a maximum head height of 6ft 5in. The bow can be converted into an additional berth with the aid of filler cushions. Up top, fore and aft sunbeds, a hydraulic swim step and a cockpit fridge, icemaker, grill and sink, are just some of the A40 Coupe’s added touches. Next up, the all-new R30. This open-bow day boat has elegant and expansive seating as well as endless storage spaces, and is the largest in Cobalt’s bowrider series. She has vast sunpads to the aft, large enough for four sun worshippers, as well as a cooler, sink and portside toilet/changing room. Like the A40, the swim step lowers in and out of the water at the touch of a button. 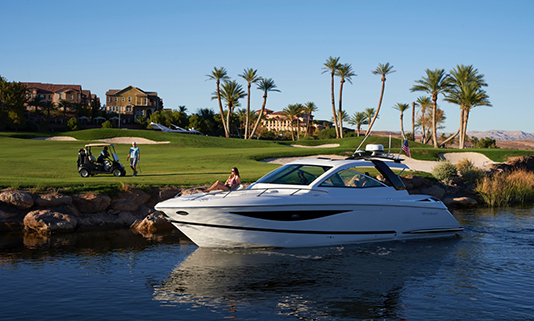 Cobalt’s R5 Water Sports Series Surf boat features Forward Drive System from Volvo Penta and a patent-pending surf control system – which automatically tunes the boat’s attitude to the optimal surf configuration. In short, the R5 WSS Surf combines all the advantages of a stern drive coupled with the wake-making capabilities of a forward drive. The wake out back is fully customisable providing smooth transitions and a wide push zone. The R5 WSS gets up on to the plane instantly and gives a comfortable quiet ride for those who aren’t being towed behind performing aquatic tricks. Finally, the Cobalt CS3, the newest boat in the Gateway Series. This is your entry-level model, the boat for people who think they can’t afford one, starting at around 70,000 USD (approx 52,000 GBP). Just over 23 foot in length, she represents a new look for Cobalt with a revamped hull and deck design, as well as some neat touches like the stitches and piping on the interior upholstery matching the accent colour on the exterior gel coat. Loads of sunbathing and seating space plus a foldout swim platform make this a superb addition to the Kansas club.